Steve Hanson with a football-shaped Deschutes River redside. Yes, as we creep through the dog days of summer, this spring’s stonefly hatch on the Deschutes seems like old news. My good friend Matt Ramsey, another veteran flyfishing guide in the Eugene area who I often collaborate with, recently sent me a bunch of great photos he took while working with our crew on the Deschutes for this year’s salmonfly hatch. Matt takes great pictures, and was generous enough to share them with me. 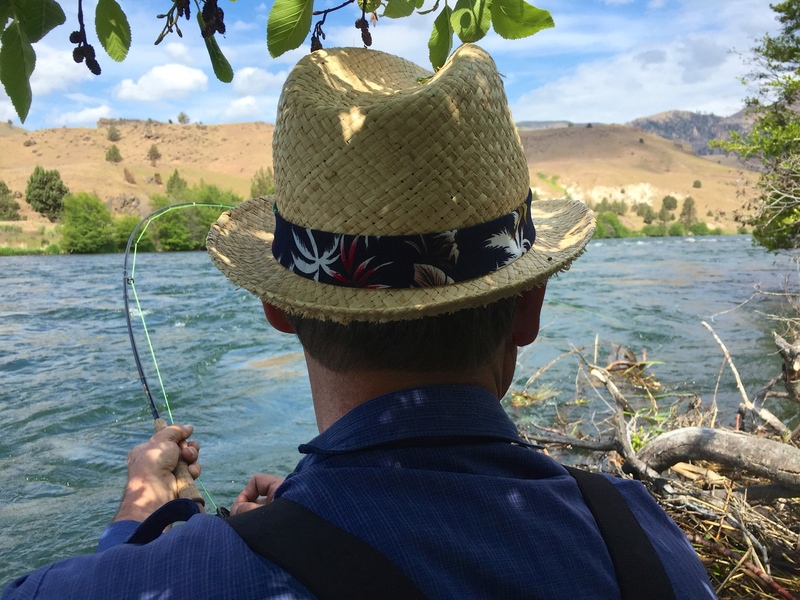 They are a great reminder of the beauty of the Deschutes River canyon in the springtime, the awesome dry fly fishing opportunities for hard-fighting Deschutes redsides. 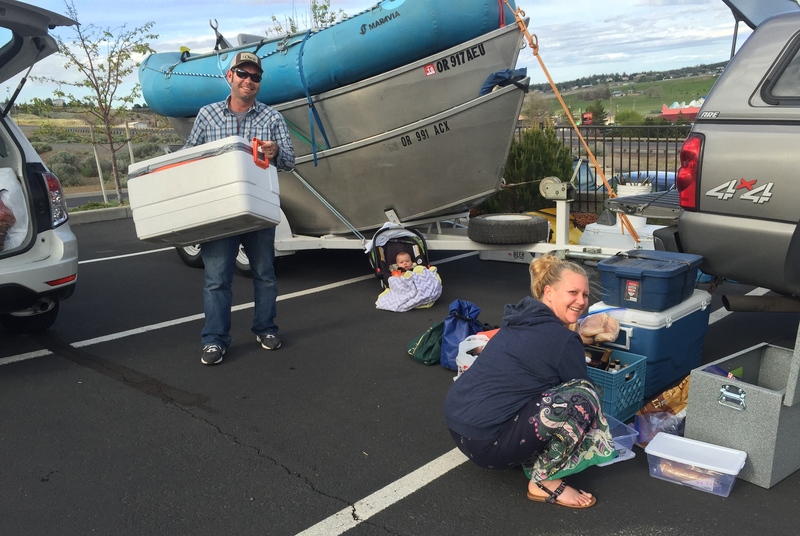 The overnight Deschutes canyon camping trip during the salmonfly hatch is one of the best fishing trips around. From the fishing, the quality and dedication of the guide staff, to the camp amenities and food, it is a top notch experience. 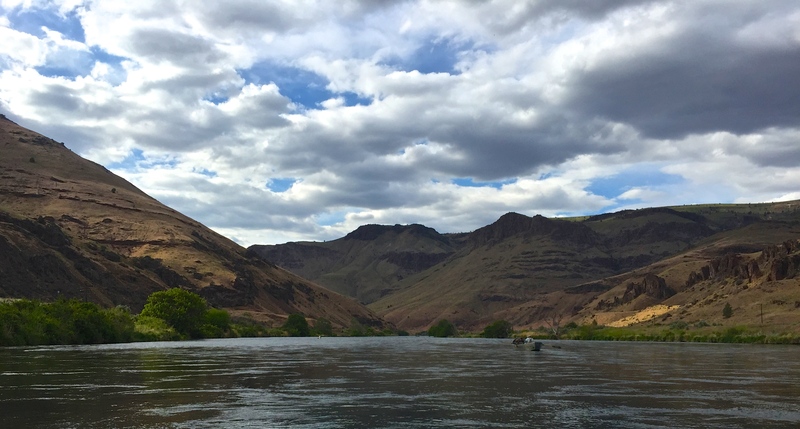 For more information on overnight Deschutes trips, please click on the Deschutes link at the top of the page. 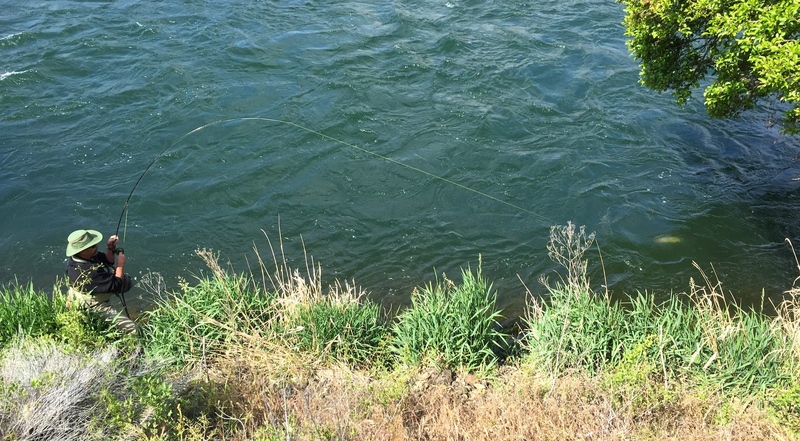 A flash in the water as a big Deschutes Redside puts a serious bend into a 5 wt. 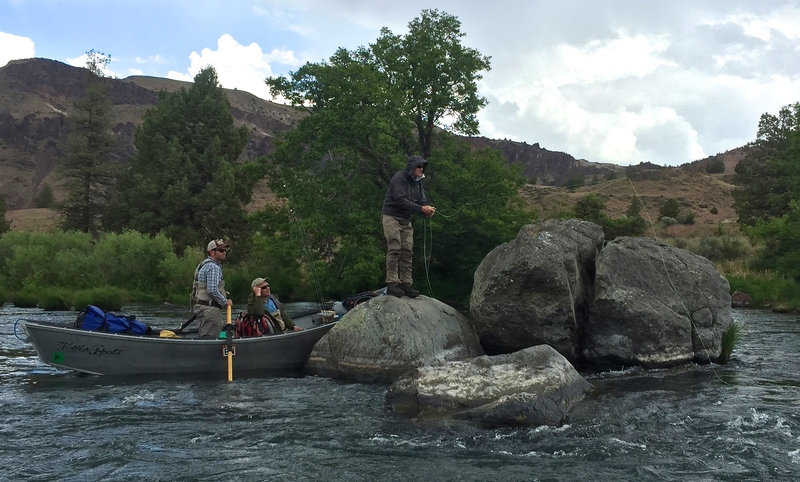 Now is a great time to start organizing and scheduling a Deschutes salmonfly trip for 2016. To guarantee the best dates and best guides, it is a good idea to start the ball rolling early. 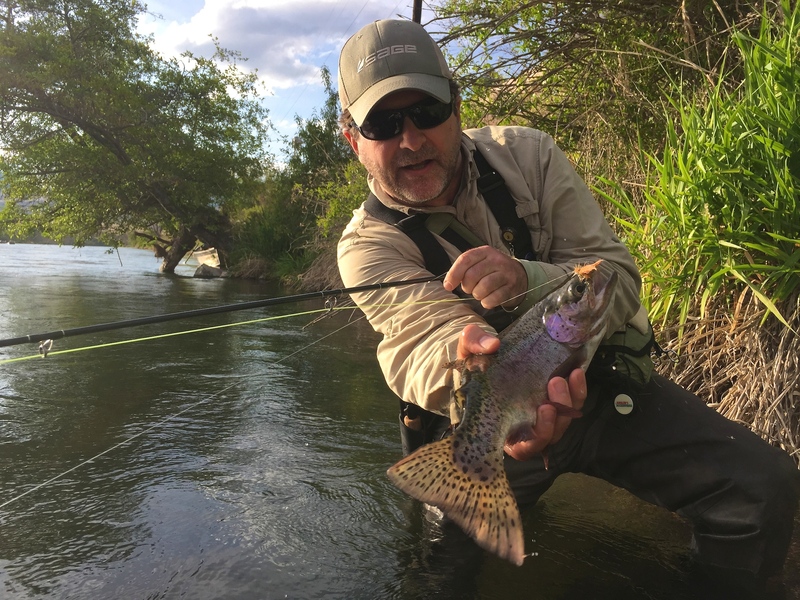 The peak dates for the hatch and the best dry fly fishing are any time between May 10 and the end of the month. Within this window of opportunity, the Deschutes salmonfly hatch is not a hit or miss type of thing; the hatch is consistent within these dates, and when the bugs are around, the fish will be looking for them. 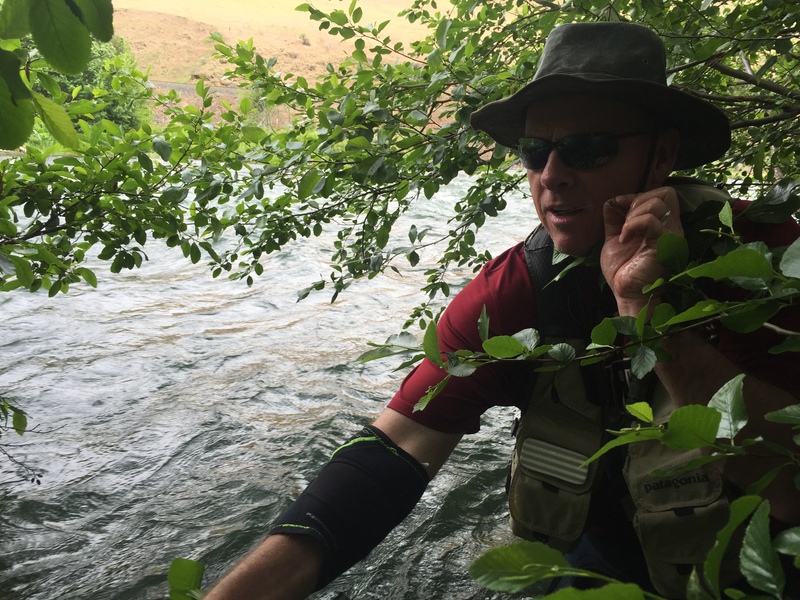 TJ Rosengarth, preparing to dig a big trout out of dense brush with a bow-and-arrow cast. Brushy spots often offer good dry fly opportunities during the salmonfly hatch. Unlike most of the bugs trout feed on, the salmonflies and golden stoneflies first migrate to the bank as nymphs and climb up onto stream side rocks and vegetation to emerge as adult insects. As a result, the trout will often lie in wait adjacent to grassy banks and overhanging limbs, waiting to ambush the big bugs. As the insects become active and begin their mating flights, however, they become available to the trout in all sorts of different types of water, including mid-stream seams and riffles. Tim Becker takes trout after trout from the seams surrounding this mid-stream rock pile. The scenery in the Deschutes Canyon in the springtime is hard to beat. 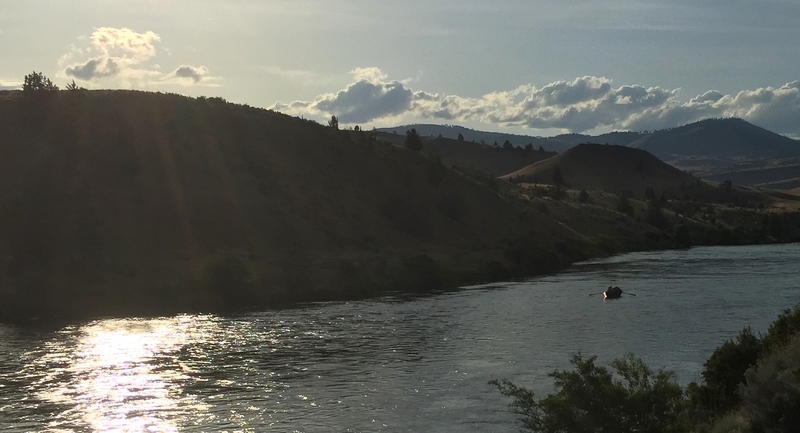 Evening light on the Deschutes and a drift boat gliding downstream. A dramatic sky, precursor to an afternoon thundershower. The salmonfly hatch is hands-down the most fun and most productive time to fish the lower Deschutes for trout. 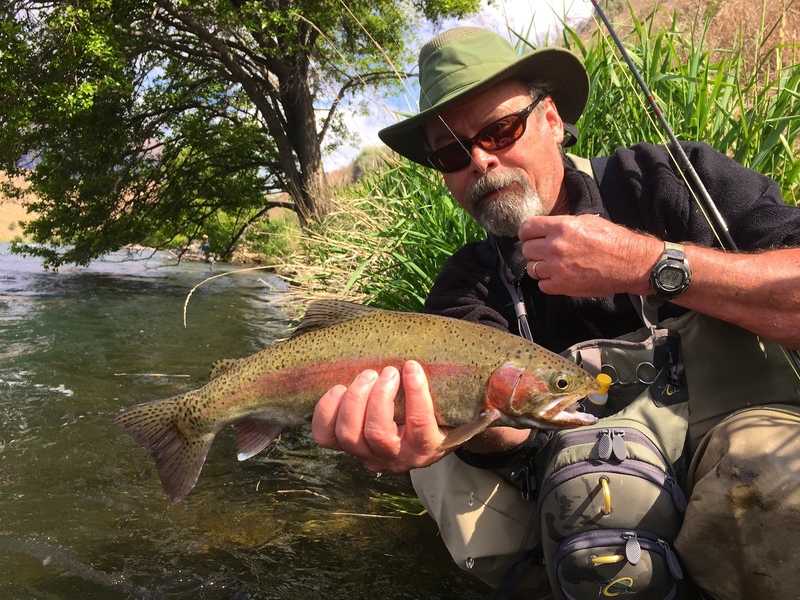 Good-sized, hungry rainbow trout and big dry flies are a great combination. Eli Krainock with his rod bent on another nice fish. 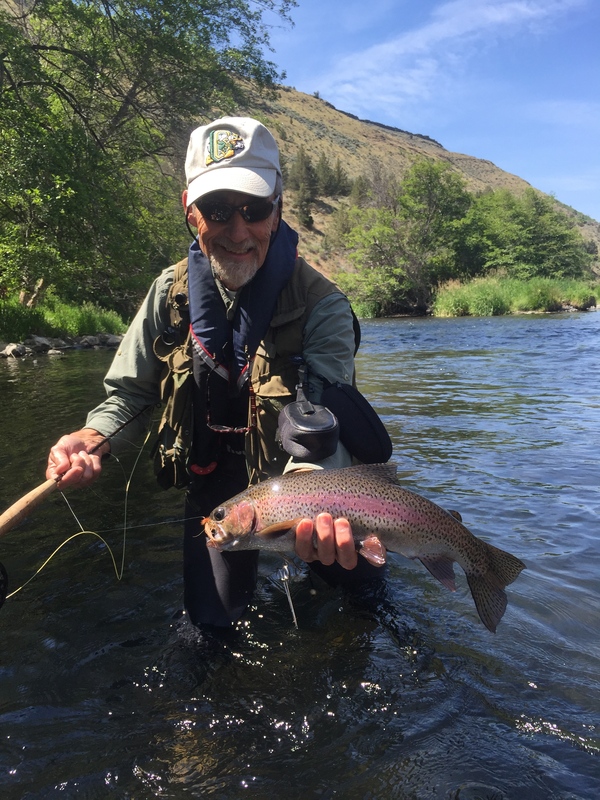 Phillip Dean with a well-fed Deschutes rainbow that pounced on a Norm Woods Special. Providing the best fishing trips possible really is our family business! Below, my wife and I are busy packing and reloading camp boxes and coolers while 4 month old Henry looks on from the shade of the boat stack. We are getting ready for another trip the following day! Teamwork at Ethan Nickel Outfitters. It is a family affair! Now is a great time to get in touch with your fishing buddies and organize a trip for next year’s salmonfly hatch. Book early to secure the best dates! MJ Lyons with a beautiful wild trout. Winter Steelhead Season Is Here!